I’ve known Molly for almost a year now. We met at a work session she leads for increased productivity. She was the most fun group facilitator I’ve ever met. She is a creative human that knows how to make people open up and find fun moments in the workaday. She even used to talk about her baby bump as “pizza”! When I found out about her struggle with depression during pregnancy, I wanted to create a space for her to tell her experience in the hope that if any of you out there have experienced the same, you felt a lot less alone. Here’s my conversation with this badass! Thanks for being open to sharing your story with us, Molly. First, tell us a bit about you and your experience. My pregnancy has been incredibly smooth, physically. I had a lot of fear going into pregnancy; fear around pain, body changes, life changes, etc. But I’ve had no physical trouble and the baby is healthy at this point. One week to go until the official due date! What I wasn’t prepared for, though, was the overwhelming depression that took over a good part of my second and third trimesters. I’d never experienced true depression. Sure, I’ve been sad and had dark times, but this feels much more serious. Almost chemical. I can’t explain why I slip into a particular spiral. It hits at any time of day in any situation. I was taking ice out of an ice tray last week and just started sobbing… head back, deep guttural sobs. No explanation. Do you remember the moment you started noticing that something was off? I remember the exact moment I realized this was more than just some moments of sadness. I had just returned from a business trip and was in the middle of Penn Station. It was my husband’s birthday and he was on a family vacation in Norway. I called my mom just to say hello while walking through the station and I lost it. Just started balling hysterically. It took me like 10 minutes to buy a subway card. I couldn’t figure out what I was doing and wound up buying a monthly pass when I had intended to just put $10 on my card. I finally got on the crowded subway with my arms full of luggage, pushed my way to an empty seat, and sobbed the whole way home. I felt like I was that out-of-control, overwhelmed pregnant woman who couldn’t get her sh*t together. There was no sense in hiding it. I just had to accept the situation. What has your journey been like? How have you been managing your health? The best thing I did was openly admit to having prenatal depression. It gave me the permission I needed to accept this part of the processes. It allowed me to lean into the sadness when it hits rather than try to pull it together and smile through it. I have a relationship with it now rather than making it a battle. Is there anything you wish you’d knew before embarking on this journey? I guess I just wish someone had warned me that depression doesn’t necessarily wait for the baby to arrive. That while yes, the first three months of the baby’s life may be the most challenging, the mental shift into motherhood can present difficulties during pregnancy as well. I’m not sure it would have affected my decision to conceive, but I least might have been armed with more tools to better understand this part of the process. Can you share 3 tips that worked for you for the women experiencing mental health challenges during their pregnancy? Talk to your friends and family about what you’re experiencing from the beginning. Pregnancy is not all roses… physically or mentally. Build that support system early. Don’t feel pressure to be excited. 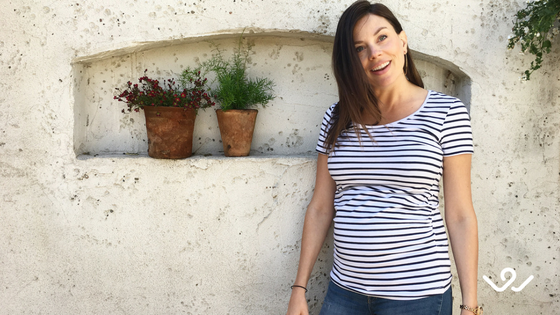 Every feeling you might have about your pregnancy is valid and excitement might not be something you feel (even if the rest of the universe is jumping for joy for you). Find resources on the subject so you don’t feel alone or isolated. Many women have gone through this, it just hasn’t been talked about as much as postpartum challenges. I hope you found this insightful and useful. Please, reach out to us if you have questions or need support! Your symptoms are valid and real, and you deserve to get the help you need. Nice Blog! This is blog is very informative. Thanks for sharing.